If a low-fat meal is on the menu, a steamer will make creating delicious yet healthy food effortless. Steaming is a great way to gently cook vegetables without losing vitamins nutrients seep out into the water when boiling and frying or sautéing means adding extra fat. When not steaming, use this striking covered saucepot to create a healthy tomato sauce to top whole wheat pasta, or simmer a nutritious homemade vegetable soup. KitchenAid Porcelain Nonstick cookware is great for stylish kitchens that are busy too. 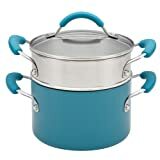 The exterior of this covered saucepot with stainless steel steamer insert is coated in porcelain enamel, which is durable, easy to clean and brings a touch of color to the kitchen. 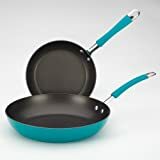 The saucepot itself is constructed from heavy gauge aluminum so it heats rapidly and evenly and the dual-riveted stainless steel handles, covered in silicone, are strong and comfortable. This saucepot is oven safe to 400-degree f, so if a recipe starts on the stove and finishes in the oven it can be completed in one piece of cookware, plus the reinforced nonstick interior means that less time is spent cleaning up after meals. This saucepot and steamer insert can be used with confidence because they carry a Hassle-Free Replacement Warranty.